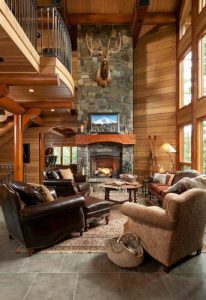 Recently, M.T.N Design was asked to provide insights about log home interior maintenance for an article in Log Cabin Homes magazine. Below is the entire conversation plus some bonus content from Sashco Stain. 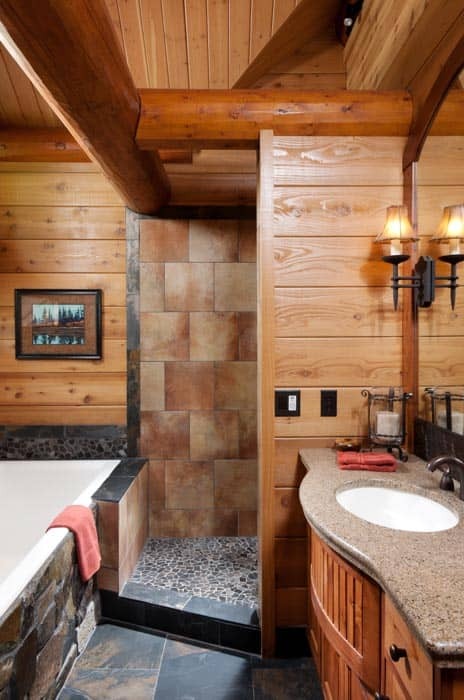 What are your top things to focus on when designing a log home to ensure interior maintenance is easy? There are two main things to keep in mind in regards to interior maintenance. One is make sure that you select durable materials that will stand the test of time. An example of these would be solid wood flooring, granite countertops, and stone or ceramic flooring. Two is to make sure that finishes are easy to clean. For example, while extremely rustic timber for example may look great, they can be difficult to clean. Smoother finishes on woods can make the going easier. What role, if any, do the log species and style play in this? Species doesn’t play much of a role in that regards. However, as mentioned in the previous point, the style of finish, such as rough-sawn versus a milled or sanded smooth surface, does. Milled or smooth surfaces will catch less dust making dusting much easier. How should you finish the interior walls for the easiest maintenance? Wood surfaces should be sanded over and sealed with a good finish. Not only will this make dusting much easier, applying a quality finish will bring out the depth of the wood grain and create an inviting warmth. Be sure to choose a finish formulated specifically for interior wood. Finishes made for the exterior are generally softer and not as easy to clean as those made for the interior. Painted surfaces should have a good durable, quality to them that’s easy to wipe down with a wet cloth. Most paint companies have a product that fits that mold. Those finishes and sheens tend to be a bit shinier than most people want in a log or timber frame home so the trick is to find the right balance between maintenance ease and aesthetic concerns. Any paint or finish recommendations? Consider whether or not you want to stain the walls a different color or if you simply want to apply a clear coat. A clear coat alone won’t protect against UV damage that can yellow the wood over time. So, if you have large windows that let in a lot of sunlight, it’s wise to apply a light coat of a pigmented stain to provide that UV protection. Areas that are unexposed to UV light are safe with only a clear coat. It’s best to get samples of different stain colors and clear coat sheens. Apply them to an inconspicuous place (like the inside of a closet). Experiment with contrasts between trim color and wall color. Experiment with different sheens – stain, semi-gloss, and gloss will all reflect light differently. Many people apply a semi-gloss to their pine tongue and groove ceiling to help better reflect light. Many people like the contrast in sheen between their doors and their walls. Do some testing to determine what you like best. The biggest recommendation though is to consult a quality paint store representative for how you can best achieve the balance stated in the previous question between ease of maintenance and aesthetic considerations. What is available as solutions for these problems can quickly change for the better in terms of maintenance and durability so they can be a big help. What about windows and doors? This is one place where we would highly recommend that you spend as much as your budget will allow. There are areas where you can look for great deals in your home and not sacrifice performance, but this is definitely one of those areas where you get what you pay for. Money invested here will go a long way in reducing maintenance issues down the road. A well-built window or door will last longer and look better longer. When selecting a metal clad window, use a manufacturer that uses a thicker metal cladding than the others. It won’t flex and buckle under temperature changes. Most window manufacturers will have a wood interior so make sure you get the species available that matches your trim species and make sure to seal it with a good high quality finish. That will make dusting and cleaning less of a chore. What flooring holds up the best with the least maintenance? 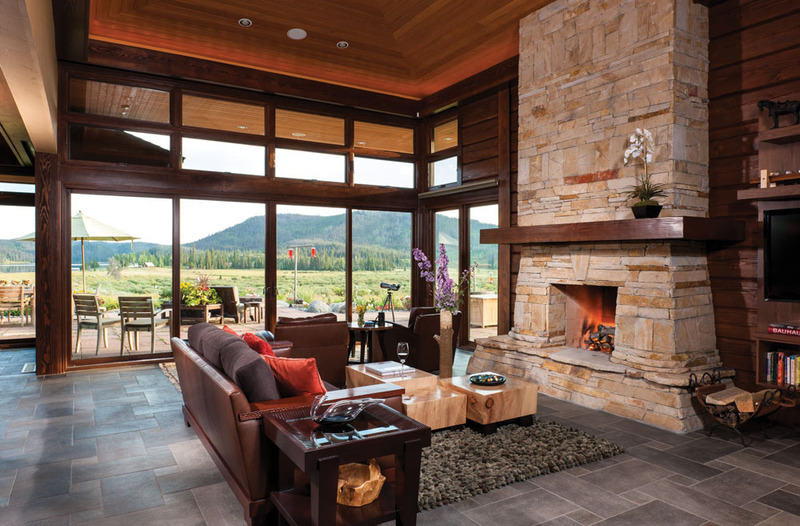 In regards to flooring, almost anything stone will hold up very well. Go with a timeless look so you can make sure it will stand the test of time. For wood, a solid hard wood is the best way to go. It will hold up better to traffic than a soft wood will and being solid instead of laminated will give you the ability to refinish it for a lifetime instead of two to three times. What about bathroom and kitchen fixtures, and appliances? Almost all fixtures and appliances will be fairly easy to clean in terms of maintenance. However, as with windows and doors, you get what you pay for here. So, try to spend a little more money if you can. It will save you in replacement and maintenance costs down the road. Solid surface will be the best in terms of maintenance. Granite is always a favorite but will require periodic sealing, usually twice a year. A great all-around product is a manufactured quartz solid surface countertop. It has the look of stone, most do not require sealing as granite does, and will take heat from a pot or pan. This is quickly becoming a favorite in the industry. Quality and durability are the key here. Other than that, cabinets are purely a personal choice. A quality cabinet will hold up longer. Look for real wood drawers instead of particle board on the sides and backs, and a high-quality hinge. What should you choose for HVAC systems, hot water heaters, and other critical components to minimize maintenance? The biggest maintenance issue with HVAC systems is dust. Conventional forced air systems carry more dust throughout the house as opposed to a radiant system which isn’t based on moving air through the home so that might be a consideration to keep in mind. As with anything we’ve talked about, keeping up on routine maintenance such as changing out air filters when required by the manufacturer will help your system run longer, perform better, and reduce the amount of dust you might see in your home. As far as hot water heaters are concerned, you basically have two choices, a conventional water heater or an on-demand tankless hot water heater. Both have their pluses and minuses. A conventional hot water heater should have the anode rods changed every 2-5 years to help get many years of service out of your tank. Tankless systems are great and gaining in popularity. A word of caution: make sure you install a sediment filter in line before the heater. Most sediment and calcium particles will fall to the bottom of a conventional tank and not work their way through to your fixtures and appliances. This isn’t so with a tankless system. Installing a filter will help keep those damaging elements from working their way to the fixtures and appliances you’ve spent hard-earned money on purchasing and will make sure that they, as well as your tankless heater, will last longer than they otherwise might. Any other interior items and considerations to help you minimize maintenance inside your home? There is. We’d recommend considering a compact florescent light or LED bulb in many of your home’s lighting fixtures. They will last much longer than incandescent light bulbs. Many of these homes have high ceilings which might require climbing a ladder to replace a bulb. This is a hassle, so bulb lifespan is something to think about. Finally, do you have any recommendations for “green” products to choose for inside the home to reduce VOCs in regard to paint, finishes, or other items? Choosing to use a “green” product is really part of a larger discussion and consideration when building a home. While those items can be good for the environment and your health, make sure you do your homework. They may or may not help with maintenance so you’ll need to balance that factor with all of the other considerations such as cost, durability, aesthetics, etc. As with anything else that becomes trendy, there are a lot of companies jumping on the band wagon so be certain to follow through on your due diligence and make sure the product lives up to the promises offered. At the end of the day, the biggest thing you can do to help the environment is to make sure that you keep your systems in good running order through periodic and routine maintenance.